Queen Hatshepsut ruled as the fifth pharaoh of the eighteenth dynasty of Egypt. She was a female pharaoh after the female rulers Niethotep, Queen Merneith, Nimaethap, and Sobekneferu but it is a fact that she reigned longer than any other woman. 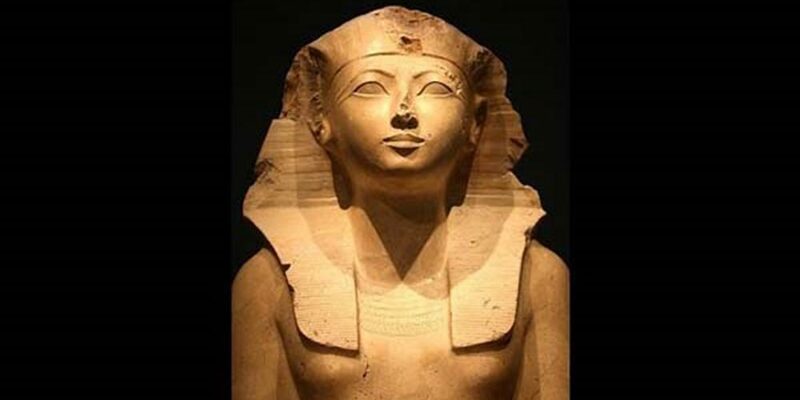 Queen Hatshepsut reached the throne of Egypt in 1478 B.C with Thutmose III; her son. She was the main wife of Thutmose II and she is considered by the majority of the Egyptologists the most successful and impressive pharaoh all through the history of ancient Egyptians. She was the only daughter to Thutmose I and his wife queen Ahmose I. She married Thutmose II, her half-brother, who was the son of Thutmose I from a secondary wife called Mutnofret and she got a daughter from him called Neferu-Ra. Thutmose II married another one called Isis and got his son Thutmose III. Queen Hatshepsut had to take some measures to protect herself as a ruler as she was a woman in a man’s position. She decided to depict herself as a daughter of the god Amun, the most powerful deity of his time. Queen Hatshepsut reigned during the New Kingdom, which starts in 1570 B.C and ended in 1069 B.C. this kingdom began with the expulsion of the foreign Hyksos from Egypt by Ahmose of Thebes. The strategy of Ahmose was based on the establishment of buffs all around the borders of Egypt in order not to let any had control over Egypt as Hyksos had. Other Rulers who followed Ahmose continued in the same campaigns just like Thutmose I and of course his daughter Hatshepsut. The God Osiris was the first ruler of Egypt. He was betrayed by his brother Set. His wife Isis tried to get him back to life again but he wasn’t completed so he became the famous Lord of the Dead. Horus, his son took his place after taking revenge for his father’s murder. All those who followed him were male rulers and there was no place for females. Prince Mentuhotep II united Egypt at the beginning of the Middle Kingdom and made Thebes the capital of Egypt and Amun became Thebes’s God. Amun’s Temple was established under the reign of Senusret I at Karnak in Thebes. Hatshepsut’s wife was the one who appointed her daughter to be the wife of Amun and from this point; Queen Hatshepsut started to know the power of authority. Queen Hatshepsut was appointed to the regent of the young King Thutmose III after the death of her husband Thutmose II. Thutmose III ruled with his mother Queen Hatshepsut until 1473 when she declared herself a pharaoh. She ruled as a male and followed the obligations of the ruler who preceded her. She also married her daughter to Thutmose III. This marriage lasted for about seven years until the death of Neferu Ra. Queen Hatshepsut learned the language of the clergy and understood the rituals associated with the god, as she was the god’s daughter. She even inscribed an oracle claiming that Amun foretold that she would become pharaoh to strengthen her position as a queen of Egypt. Senenmut, her main steward, helped her in all of her affairs and being able to rule the state in an impressive way. Queen Hatshepsut ruled for about 22 years and during that time, she was responsible for building projects more than any other pharaoh in addition to the fact that her reign period was a period of peace and prosperity and she sent military expeditions against the neighboring countries of Syria and Nubia. Queen Hatshepsut added a lot to the Temple of Mut at Karnak from further temples, monuments, and the two magnificent obelisks in the entrance by the clever architect Ineni. You can witness the monuments of Queen Hatshepsut and discover the landmarks of Luxor & Aswan through our Egypt Nile Cruises. Punt is located in the southeastern of Africa and it was known as “the Land’s of Gods”. Hatshepsut’s trip to Punt in the ninth year of her reign was very successful as she brought back all goodly fragrant woods of God’s-land, heaps of myrrh-resin with fresh with ebony, pure ivory, and green gold of Emu, with myrrh trees. There is very interesting information that no ruler before Queen Hatshepsut had been successful in Punt like her. Queen Hatshepsut died in 1458 B.C and scientists believe that the main reason for her death was using ointment to alleviate a chronic genetic skin condition, which contained a toxic ingredient. Soon after her death, her co-ruler Thutmose III succeeded the female pharaoh and didn’t honor her although she had a burial in Valley of the Kings. Monuments were attacked, Hatshepsut’s statues dragged down and smashed immediately after her death. Her image and titles defaced by Thutmose III to gain credit for some of the successes Queen Hatshepsut experienced during her rule. By doing this, he thought that he is going to be Egypt’s greatest pharaoh. All his destruction work was due to his deep grudge and he wanted to make sure that no one could challenge his son Amenhotep II for the throne. Thutmose III was afraid that the illustrious reign of a woman would inspire other women to seek positions of power. Cleopatra VII came at the end of the 19th century and ruled Egypt as a female ruler. Her Mummy was discovered in Valley of the Kings in 2007 and she looked in her fifties when she died. She was suffering from diabetes and wearing black and red nail polish in addition to having a desire for perfume. Her corpse was even hidden from Thutmose III as they were afraid that he was going to desecrate the corpse. The mummy of Queen Hatshepsut was identified through matching a tooth known to be Hatshepsut’s with an empty socket in the mummy’s jaw and DNA testing with Queen Hatshepsut’s grandmother. Despite the destruction of most of her major works, her memory can’t be erased from our minds as the most successful female Egyptian ruler. Finally, If you are fond of traveling to explore the historical sites in Egypt, we think the chance to discover Egypt through our Egypt tour packages is enough to satisfy your adventure needs and discover the landmarks of Egypt in a way most can only dream of.